St. Paul, named Saul at his circumcision, a Jew of the tribe of Benjamin, was born at Tarsus, the capitol of Cilicia. He was a Roman citizen. He was brought up as a strict Jew, and later became a violent persecutor of the Christians. While on his way to Damascus to make new arrests of Christians, he was suddenly converted by a miraculous apparition of Our Lord. From a fierce persecutor he became the great Apostle of the Gentiles. He made three missionary journeys which brought him to the great centers of Asia Minor and southern Europe, and made many converts. Fourteen of his Epistles are found in the New Testament. 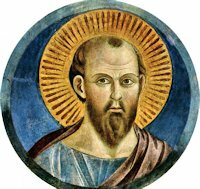 He was beheaded in Rome in 66, and his body is kept in the Basilica of St. Paul near the Ostian Way.